Home » The NSA’s message from the Extraterrestrials, on their website! Not a lot of people realise this but the NSA have on their website proof of Extraterrestrial contact under the title “Key to the Extraterrestrial messages” (found under www.nsa.gov). This is a hugely important step towards Disclosure and something which is far too overlooked by the UFO community. The original document was cleared for public release back in October 2004, but strangely not ‘officially’ released into the Public Domain until April 2011! Such an important document needs to be seen by the world as this is on the NSA’s actual website, sat there waiting for all to see. We want Disclosure of Alien contact, then here you go! This one small step, yet ‘Giant Leap For Mankind’, is best described as a ‘treasure trove’. Of the documents available, one is particularly interesting from the NSA Technical Journal Vol XIV No 1 with FOIA Case number 41472 which has been titled ‘Extraterrestrial Intelligence’. “Recently a series of radio messages was heard coming from outer space. The transmission was not continuous, but cut by pauses into pieces which could be taken as units, for they were repeated over and over again. The pauses show here as punctuation. If anybody ever mocks you for believing in Aliens, then please feel free to steer them towards the NSA’s website! On October 21, 2004, the NSA approved for release to the public a portion of their NSA Journal Vol. XIV No. 1. This is a report of a presentation given to the NSA by Dr. Howard Campaigne regarding the decoding of extraterrestrial messages that had been received “from outer space”. Apparently, these messages had actually been received via the Sputnik satellite, but no one had any idea how to decode them at the time. At some time, unspecified in the document, Dr. Howard Campaigne and some other NSA super mathematicians in the crypto department had been given the task of decoding the messages. There were a total of 29 messages to be decoded — quite an undertaking. It is curious, to say the least, that this document was cleared for release on October 21, 2004. Why was that? Because the NSA did not release it into public information until April 21, 2011. Though cleared for release, the NSA had been stonewalling it along with hundreds of other NSA documents about contact with UFOs and extraterrestrials until they lost the lawsuit brought by Peter Gersten, a lawyer from Arizona. When they well and truly lost, the judge’s order had to be carried out, and the documents had to be released. The document, as I stated, is Dr. Campaigne’s presentation to the NSA on the decoding of those messages. It was actually published by the NSA in their own internal NSA Journal. Yet, they were also forced to publish a list of search terms from FOIA requests for which they had found no NSA documents. In that list is “Extraterrestrial Signals”. 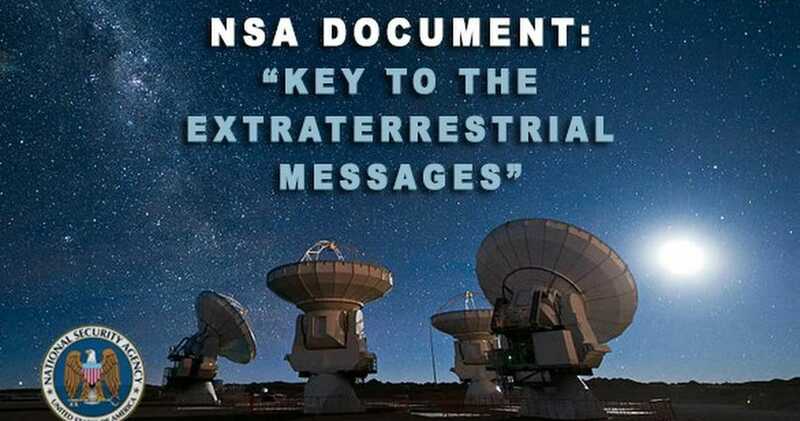 The title of this document, which they published themselves is “Key To Extraterrestrial Messages”. Quite obviously, they conveniently split hairs here in reporting they had no information about“Extraterrestrial Signals”. They knew for sure they had this document, and that it was about what was being requested in the FOIA request. They knew it, flaunted the technicality of wording, and continued to stonewall. Who is Dr. Howard Campaigne? Dr. Campaigne is one of the top cryptologists on the planet with years and years of service to Naval Security Group, Army Security Agency, National Security Agency, and a couple of other such alphabet organizations. Howard H. Campaigne started his crypto career for the government during World War II and has been a key and integral part of our U.S. security and intelligence ever since. In other words, he is part of a very small, very select group who are considered the cream of the crop in Cryptology. Dr. Campaigne’s presentation to the NSA on decoding the extraterrestrial messages was not a hypothetical exercise. I contacted someone who is formerly associated with the NSA and still has TS clearance, and asked him to view the document. I asked him to give me his take on it. There was no question about its authenticity since it was published in the NSA Journal, and was released by the NSA on their web site. What I wanted to know was whether this document had any particular impact or importance (other than its startling revelations) for someone familiar with the inner workings of the NSA. It did. My contact told me that he was blown away by the wording of the document. He said that NSA communications are filled with words like “possibly” , “allegedly”, and “thought to be”. But what do the messages say? Dr. Campaigne focused on a set of information in a couple of the messages that turn out to be some mathematical equations. They also contain the listing of all the elements in our Periodic Table. I suppose those equations may make some sense to a physicist or engineer, but do not mean anything to me. I clearly understand how Dr. Campaigne came to the translation since he explains it very well. But, as to what the meaning of the equations are, I could not venture a guess. It is curious, though, that during his presentation Dr. Campaigne mentions there are “words” that they have translated, and some “words” they have not yet begun to understand. He gives an example of a connective word that he knows is connective (joining two or more statements) but does not yet understand the translation of that word. Debunkers are scared as hell of the release of this information as it proves beyond any doubt that they are, and always have been, dead wrong. As usual, they are either just uninformed, or outright lying. It is true the document was cleared for release on October 21, 2004. It is true that date is from “years”. But it is also true that it WAS NOT released until April 21, 2011. This is truly blockbuster information. No one from the government has stepped in front of the cameras and come clean about ET reality as yet. But, here we have the most secret intelligence organization in the U.S.A. , the National Security Agency, disclosing openly that there has been contact with intelligent extraterrestrials. Not only that, we have decoded their messages. The National Security Agency (NSA) has released a number of previously classified UFO and extraterrestrial documents over the past couple of years. This one comes straight from the NSA Technical Journal – Vol. X1, No.1, written by H. Campaigne. The journal entry is titled “Key To The Extraterrestrial Messages”. A signal is detected from outer space, and the NSA attempts to decode the message. How do we determine the validity of this document? The source has a www.nsa.gov URL. You cannot fake a .gov URL, it’s impossible. The document is considered public information and is available through the official NSA website. There is another link to the document found from a search query straight from the NSA website, you can view that in the list of sources as well. This document is 100 % real, and was approved for declassification by the NSA. The extraterrestrial phenomenon is a large one, and branches off into so many different subjects. Now more so than ever, it has become extremely clear that agencies like the NSA don’t really represent the people that they are said to protect. It seems they use the shield of ‘national security’ to classify information and justify certain actions. Please keep in mind that NSA documents do not represent and speak for all UFO documentation. Thousands upon thousands of official UFO documentation is available in the public domain. Military agencies and governments worldwide have been declassifying files for a few years now, and some of them are quite astonishing encounters. What conclusions can we draw from this document? One conclusion we CAN draw is that the NSA has an active interest in the search for extraterrestrial life. Humanity has always believed that NASA is the primary body interested and heading the search for extraterrestrial life. Did we ever stop to consider that almost half of the United States budget goes to agencies that are under the jurisdiction of the Department of Defence? If anybody has the resources to look into the extraterrestrial subject, it’s agencies like the NSA. The release of this document also tells us that extraterrestrial matters remain classified and all monitoring of extraterrestrial activity remains classified. Only a few documents have been released, I wonder what still remains classified? The United States Air Force also has a space agency separate from NASA. It’s called the USAF Space Command.